In the past, I've talked a bit about my struggle with diabetes and what it's like to live day-to-day with a chronic condition. Today, I own the fact that I have diabetes. While I sometimes struggle with it and sometimes just want to "be normal," I've slowly embraced that it's a part of who I am. But as a child, it was tough understanding my diabetes and what that really meant. I knew part of me didn't work, but I didn't 100% grasp what it was or why it didn't work. I had this idea of the pancreas as a dump truck that delivered insulin to eat sugar, which is a pretty accurate way to describe it (and believe me, I am so grateful to the nurses and doctors and advocates at CHOA that helped me to understand what was happening to me). I do wish that I could've had a better understanding of the pancreas and what it does. Now that I understand the pancreas and my condition a little better, I advocate for others to understand the pancreas, especially younger children who have or are close to someone who has diabetes. Learning about the body and different conditions is important, and I really don't think that people (children and adults) learn enough about how our bodies work. I mean, we're steering them around through life, with no idea how that's even happening! In comes I Heart Guts. I Heart Guts is a wonderful website that spills the guts on guts! Okay, okay. It sounds vulgar, but I promise you it's not! This site offers information and merchandise on over 50 different guts, ranging from skin, muscles, and joints, to internal organs, to glands. The merchandise ranges from plushes, to lapel pins, to posters, and more! You can shop by product or by your specific gut. Of course I chose the pancreas (in a plush and a lapel pin, see below), but who's to say I'll stop there? Maybe next I'll buy a uterus, or a heart of gold! You can meet all the guts here, and use code APAPERARROW25% to get 25% off your entire order! Not to mention their shipping is super quick. I purchased my guts on Wednesday night, and even with the cheapest shipping (like $2-3), my pancreases were in my mailbox by Friday. Impressive! 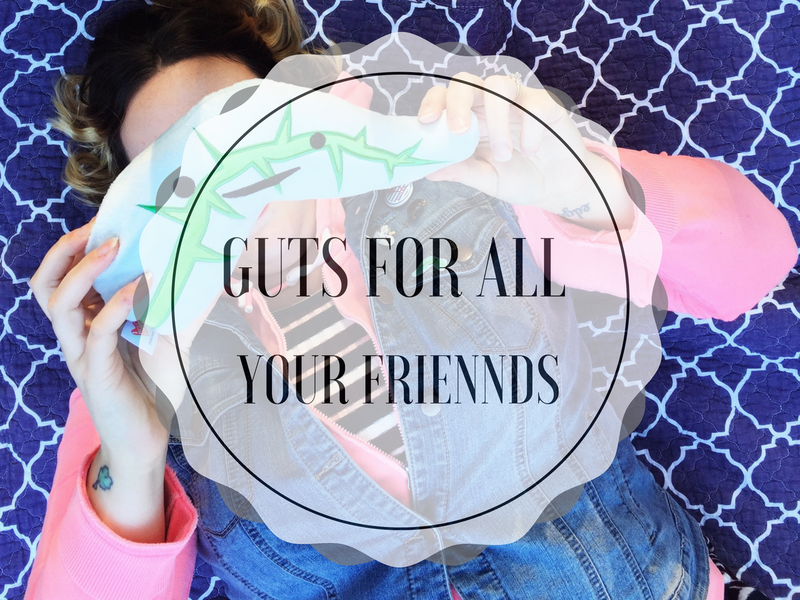 Whether it's for someone with a condition, someone with a broken heart, or someone who just is really into anatomy, I Heart Guts products are the perfect educational and fun gift for everyone in your life. I think so, too! I was so excited to find them. The little faces are just adorable! First of all cutest pictures! And what a great cause and website! Thank you! I worked very hard with myself and my timer to take them. Lol. And yes, I agree!